A complimentary copy of the Photovoice book is also available. BRANDON, MB. 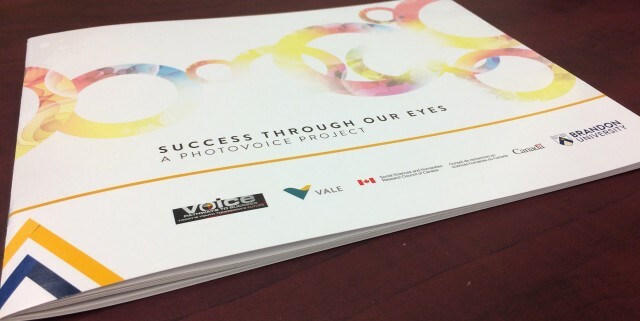 — “Success Through Our Eyes: A Photovoice Project” opens at the Gathering Space in the John E. Robbins Library at Brandon University (BU) on Thursday, March 24, 2016 at 2:30 p.m. The exhibit accompanies the launch of the Success Through Our Eyes booklet in which First Nations, Métis and Inuit youth from across Manitoba tell their stories of educational success and leadership. Photovoice is a community-based participatory research process in which participants use photography to document community issues about which they feel strongly. “The photos in this display are an important message from Indigenous youth and showcase how Indigenous culture and education have helped these Indigenous youth leaders succeed,” said Karen Rempel, Director of the Brandon University Centre for Aboriginal and Rural Education Studies (BU CARES). “The Success Through Our Eyes booklet uses biography, art and storytelling to communicate Indigenous youth perspectives to the broader community, government and policy makers, and is a creative and compelling way to give voice to young indigenous leaders” said Heather Duncan, Dean, Faculty of Education and Associate Vice-President (Research). The photovoice research project will inform a broader understanding of indicators of Indigenous youth success and leadership. Visitors are invited to explore the exhibit and take a complimentary copy of the booklet.